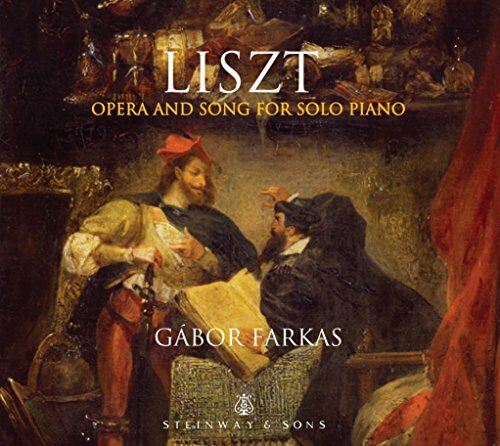 Gábor Farkas has several prize-winning Liszt releases to his credit, and the pianist’s all-Liszt Steinway & Sons debut gives further proof of his affinity for this composer’s aesthetic. In the paraphrase on the Waltz from Gounod’s Faust, Farkas makes salient points through finely honed details such as the shading of chords and delicate, supple staccato runs. It differs from the lilting sweep and extroversion heard in other Faust paraphrase recordings by Thibaudet, Wild, and Petri, yet it convinces on its own terms. The paraphrase on themes from Verdi’s Aida falls short of Claudio Arrau’s sonorous drama and long-lined phrasing, but the two Chopin song transcriptions (“Spring” and “My Joys”) are thoughtfully phrased and inflected. Farkas’ tone opens up more in the Wagner/Liszt Liebestod, and he shapes the tremolos in a way that minimizes their usual, clattery “silent movie” impact. I like the simplicity and colorful understatement that Farkas brings to three rarely performed Clara Schumann song transcriptions, although his slightly underplayed rendition of the Robert Schumann/Liszt Widmung prevents the big tunes from soaring as they do in Van Cliburn’s altogether grander interpretation. Liszt’s solo version of Totentanz manages to fuse the original’s orchestral and solo parts with little effort or clutter, and Farkas’ effortless and clear textural delineation makes a compelling and plausible case for a transcription that usually sends pianists ducking for cover. That said, Arnaldo Cohen’s Naxos recording captures more of the music’s incendiary, swashbuckling nature; you only have to compare the rapid chordal leaps and upward interlocking octave passages to hear the difference. In all, Farkas is an intelligent and elegant Liszt stylist who knows how he wants this music to go, and I’m glad to hear him out, small reservations aside.